It wasn’t clear at first, but after repeated scrapes of similar appearance and orientation, Cyndie and I have come to the conclusion that Dezirea is getting bitten. Most likely, as a function of hierarchy “negotiations” within the tiny herd of three horses. A pattern of bite-sized scrapes is showing up on both sides of her rump with an unfortunate regularity of late. We haven’t caught anyone in the act, but I have seen Hunter pinning his ears back and moving her around enough to suspect that it’s him taking things to the next level when we’re not around. I take some solace in remembering the time I was standing right next to them when Dezirea leaned forward and let loose a kick with two back hooves, landing them with such impact on Hunters chest that even I felt the energy. She knows how to dish out her own discipline when the situation calls for it. If the evidence of biting continues, we may cover Dezirea with a blanket to give her hide a break, but for now we have chosen to see if they can work this out as nature would have it. Cyndie already saw some interaction during yesterday afternoon’s mealtime that revealed Dezirea is not simply playing the victim. 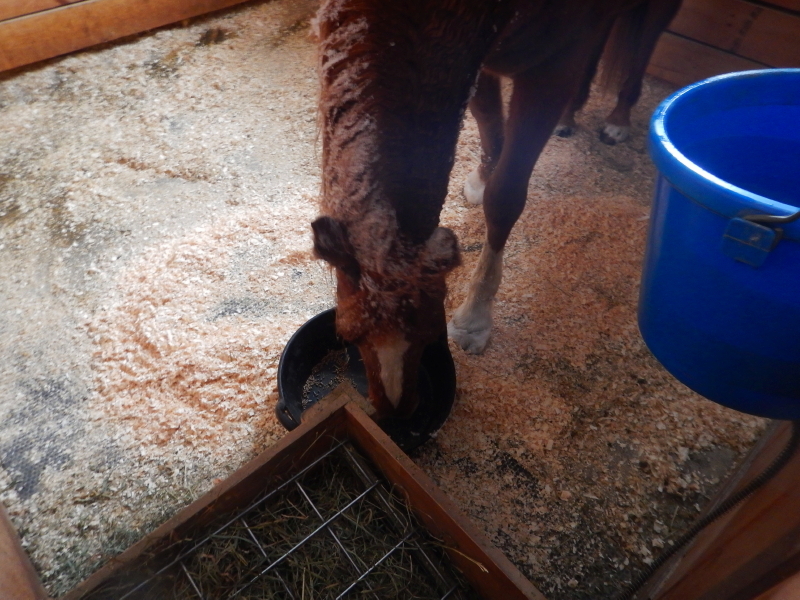 The elder mare moved the other two off each of their food, showing she can exert some control of her own. Heck, it could be such behavior is why she is getting bitten in the first place. This all tugs at our ongoing ache of missing Legacy, seeing them without the strong leadership he always commanded. There were plenty of times when the three chestnuts would test things between each other, but it never went on for more than a brief time before Legacy would pass judgement and direct them all to knock it off. In two months, it will have been a year since Legacy died, and the three are still searching for a new normal of life without him. In plenty of ways, we are, too. Oh, yes, there is a pecking order among the chickens. The horses, too, for that matter, although there isn’t so much pecking involved with those three. It’s more like a big bite. Lately, Cyndie has noticed that Hunter is taking issue with Dezirea. The other day he kicked in her direction with both legs to make his point. 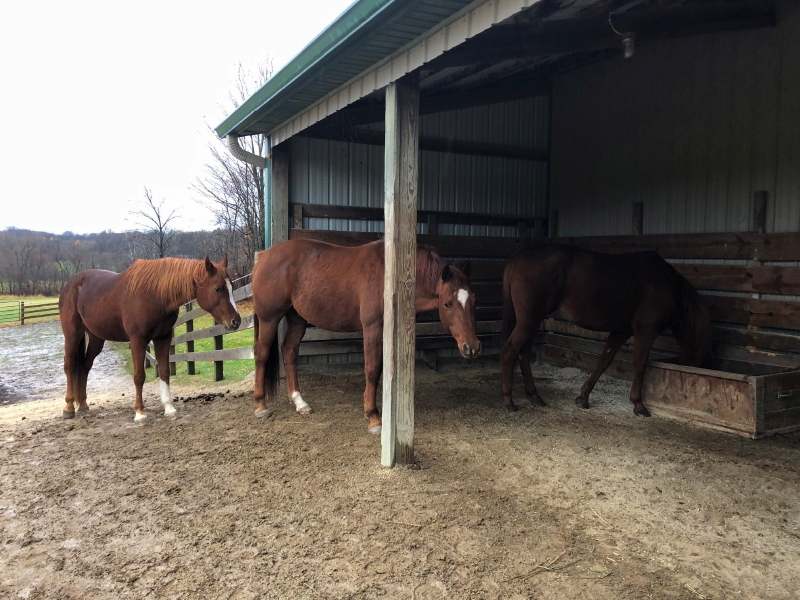 I got frustrated with the horses’ antics a few days ago while doing the regular “housekeeping” under the overhang, so I established a horse-free zone until I was finished. I pinned my ears back, figuratively, and ushered them all out with big energy. There is no question about their understanding. After a few tries to return, which were met with my same high energy message, they resorted to pacing along the imaginary boundary I had established. Several times, when I turned to deposit a scoopful into the wheelbarrow, Hunter checked to see if the order was still in effect, by trying to step in behind me. I simply turned back from my task to assure him I wasn’t done yet and the area was still closed to them. After Cayenne’s little nip on my shoulder last week, they have been receiving fresh messages from me that I am above them in the pecking order around here, and demanding the respect that a herd leader deserves. 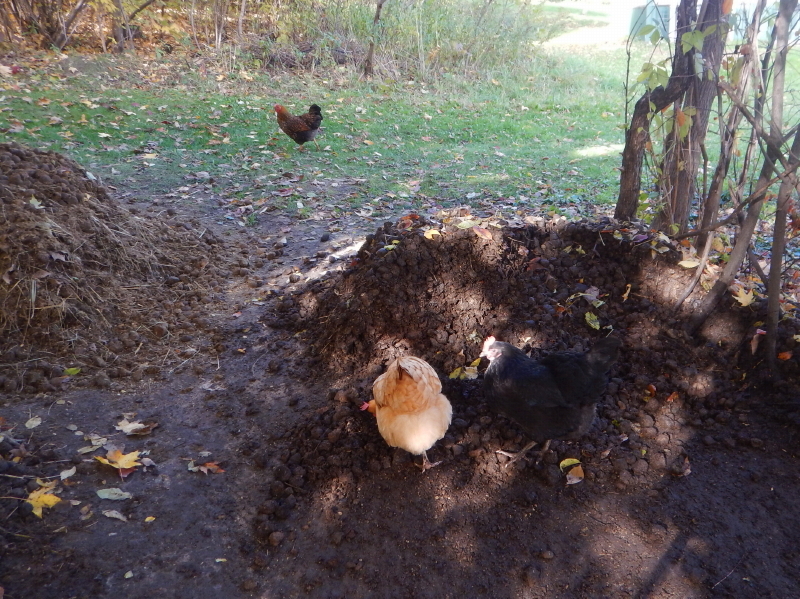 Yesterday afternoon, I puttered in the compost area with the chickens, moving piles around to create new space. Two chickens, in particular, a yellow Buff Orpington and black Australorp, appeared to be in some sort of contest to outdo each other to see who could eat the most of whatever the disturbed piles revealed. It’s fascinating to watch the chickens work, actually. They have a very keen eye for the movement of crawling and wiggling creatures. When I slide the pitchfork into a pile and lift out a scoop, there can be quite a few worms or centipedes uncovered and the chickens pursue them with gusto. At first, the birds are jumpy about my activity and they flinch and startle over my movements, but with each successive rotation of my coming in with the fork or scoop, and then pulling out to turn and dump it in a different spot, they show more confidence. This allows them to remain close –I would even call it, in the way– so that they are in prime position to make the most of the easy pickings when my fork suddenly uncovers many different delicacies all at once. I actually adjusted my task to accommodate them, splitting my attention between two piles to give the chickens full access to one whenever so many birds showed up at once to feast that I couldn’t dig around them. I saw that same Buff Orpington and an Australorp pair get into a wrestling match over one morsel. Eventually, I noticed the Wyandottes get picked on and chased away by both other breeds. They seem to be the lowest in the pecking order. This adds intrigue to the fact that one Wyandotte often chooses to perch on the tiny space of a cross stud against the wall above the window in the coop at night. That spot is well above all the rest of the hens on the roost. Maybe she is making a statement to all the others by spending the night alone up there. I have finally seen the first egg laid without a shell. On Monday, Cyndie came from collecting eggs at the coop and showed me the crazy thing. 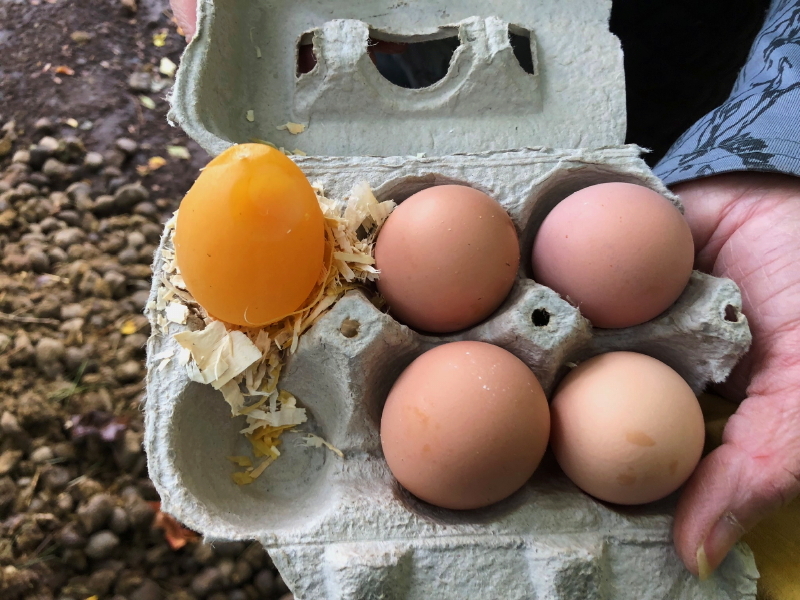 The shell-less membrane was sturdy enough to be gently handled without rupturing, and as visible in the image, looked full-sized and held the shape of a regular egg. We had read about this happening, but I could never picture what it would be like. Now I know. Very interesting. I experienced another first yesterday, and it was a crazy thing, too. Cayenne bit me on the shoulder while I was scooping poop under the overhang. 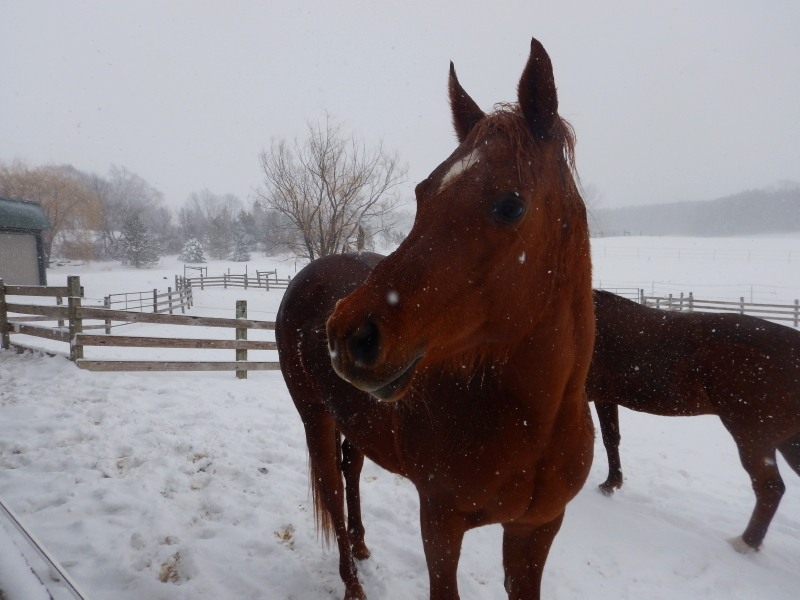 That is a very uncharacteristic behavior from the sweetest of our three horses. 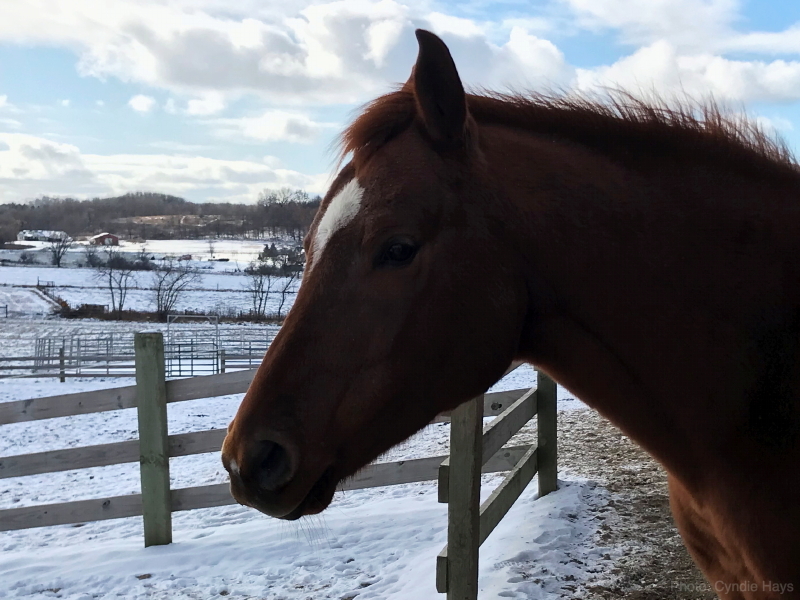 My startled response and yelp made all the horses jump, but my amped up angry energy directed unmistakably toward her chased her out from under the overhang and pushed her trotting down the slope toward the waterer. 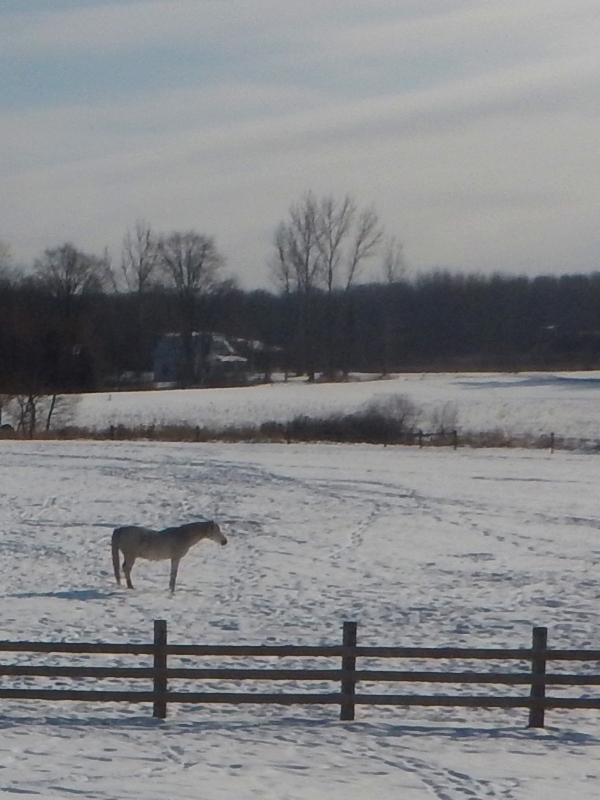 We all quickly went back to grazing, but I was much less generous about sharing space with them while I worked. None of the three were subsequently allowed the usual close quarters they are normally granted while I do the housekeeping chore. I’m not sure what message she meant to send with that nip of my shoulder, but I get the impression that all three of the horses are feeling a little out of sorts lately. Don’t know if it might be the changing weather, or their continued uncertainty about a herd leader, or accumulated frustration over their restricted diet. A diet which, by the way, has produced noticeable results in their weight this summer. 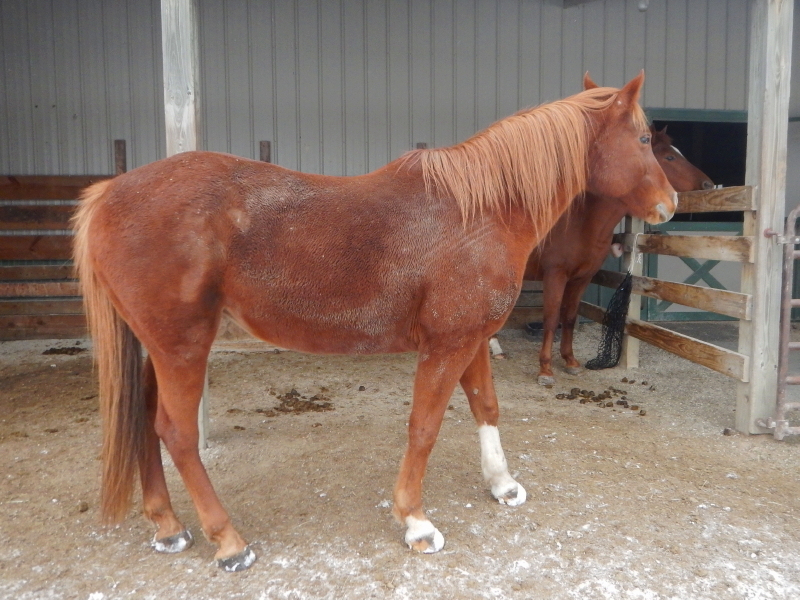 Maybe they are feeling ornery because of the cooler temperatures and shorter days, and as a result they want to bulk up a little before it starts to get really cold. Cayenne may have been trying to urge me to stop with the clean up already and get on with serving some dinner. I finished the evening with one last crazy thing just before bedtime. I went out in the dark and worked with Cyndie to load the foosball table top into the back of my car to deliver to a buyer who found it on Craigslist. I’d actually forgotten about the listing that I put up the same time as the lawn tractor that sold in a few days. The one and only call of interest in the foosball table came around dinner time yesterday, and the proximity of my workplace in Plymouth turned out to be a convenient meeting place. Pretty lucky for an ad that reported River Falls, WI as the location. You might even call it, crazy. 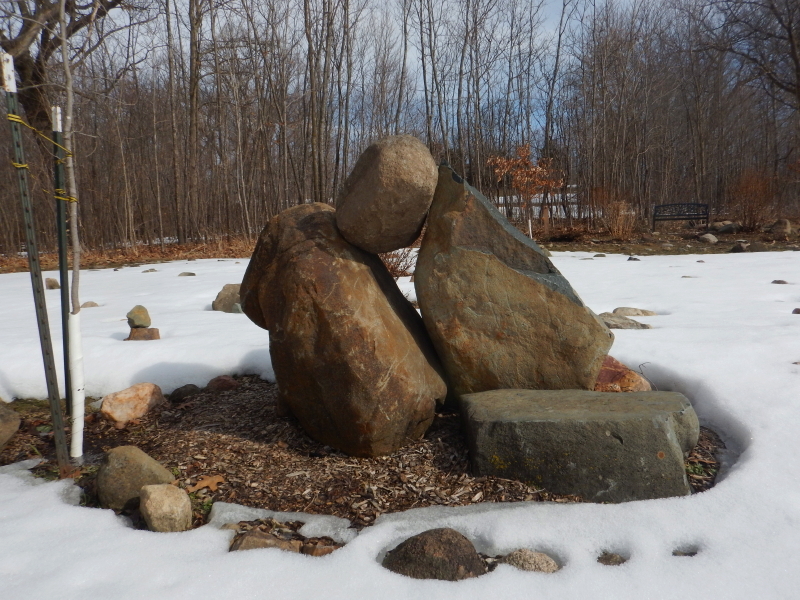 The heavy rock that took five people to lift into place on the boulders at the center of our labyrinth has survived the worst that winter tossed its way. It didn’t fall out and roll to the ground. However, it did lean over to a significant degree. I think it might be a metaphor for how Cyndie and I feel after the number of challenges we have faced in the last few months, starting with the unexpected death of our lead horse, Legacy. Just as we began to think we were coming to terms with one thing, another challenge would blow in on us. It all pretty much tipped us over to a similar degree. It occurred to us, more than once, that one way to avoid falling to earth would be by simply choosing to jump down of our own volition. It’s funny. In a way, it took a leap of faith in the first place to get where we are today. Now we have wondered about taking a leap right back out of here, to be done with the struggles confounding our original vision. The thing is, as crucial a part of our dream as Legacy was, I don’t want his dying to linger as the insurmountable disturbance that extinguished the flame of possibility for good. It doesn’t do proper justice to him or his name. Losing Legacy can be a powerful lesson for us to grasp and embrace. Really, anything we might accomplish going forward, will be in honor of him and all he contributed here. This past weekend, for the first time since he died, we witnessed the three chestnuts execute a completely unexpected “Emergency Response Drill.” It was a big deal to us. Legacy, as herd leader, used to initiate these surprise escape drills at feeding time as a way to see he could get the herd moving in a moments notice, even if it meant leaving their food. They all run away with a full-speed urgency that implies all lives are at stake. At about ten paces away, they pull up short, turn around to assess the situation, and then walk back and finish eating. It’s invigorating to watch, especially when you just so happen to be standing in the vicinity with a manure scoop, at risk of being inadvertently trampled by their frantic departure. Neither Cyndie nor I spotted who initiated the drill, but simply knowing the herd is resuming their group behaviors was comforting. I don’t know if this will culminate in a clear establishment of a new leader, but I’m pleased to see they are working on some kind of arrangement. 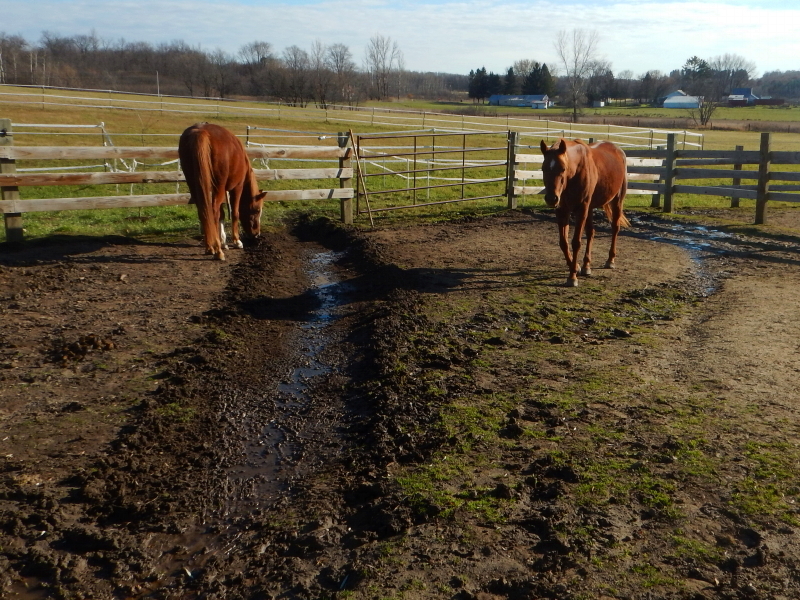 Cyndie reported that the mares initiated another drill yesterday, while Hunter just happened to be rolling on the wet, muddy ground, which forced him to abort his plan and get back to his feet, pronto. Yes, they are definitely working on something. Poor guy is outnumbered now, so I won’t be surprised if either Cayenne (who has always behaved like a big sister with him) or Dezirea end up filling the role as primary head of their household. We’ve all been pushed over a little bit since the start of the year, but we haven’t hit the ground. 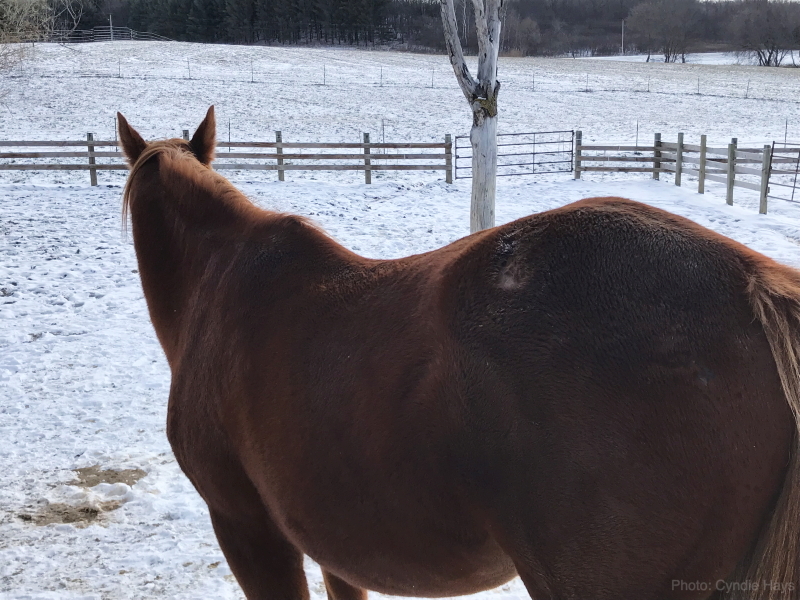 Knowing the horses are working things out, and having a brood of new chicks to fawn over, helps provide inspiration for us to visualize righting ourselves and doing Legacy proud. I think we are making strides toward steadying ourselves to lean into whatever might unfold next.